The electrical grid consists of power generation, transmission, distribution, and customer assets that literally cover the face of the earth. 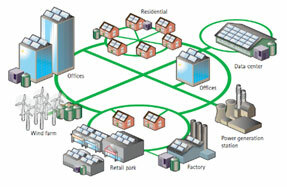 Ultimately, the smart grid is all about awareness of the situation of these assets in order to facilitate optimal performance and effectively anticipate and respond to events that might disrupt performance. A geographic information system (GIS) is the method by which utilities capture, store, manipulate, analyze, and manage geospatially referenced information about these assets. Geodata types relevant to electric utilities might include everything from land-based data, streets, ownership/real estate, vegetation, network topology, GPS location data, census data, and many others.